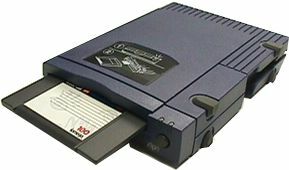 The Iomega Zip drive was originally available in 100MB size and interfaced with the computer either using the parallel port for DOS/Windows or the SCSI port for Macintosh. Popularity declined after the rise of the recordable CD and the quality issue known as the "Click Of Death." the standard 1.44 MB floppy disk. Write transfer rate = 61.6 KBytes/Sec. Read  transfer rate = 78.6 KBytes/Sec. Simulated "Typical" rate = 56 KBytes/Sec. Write transfer rate = 1084 KBytes/Sec. Read  transfer rate = 1123 KBytes/Sec. Simulated "Typical" rate = 148 KBytes/Sec. Write transfer rate = 1497 KBytes/Sec. Read  transfer rate = 1850 KBytes/Sec. Simulated "Typical" rate = 189 KBytes/Sec. Write transfer rate = 1367 KBytes/Sec. Read  transfer rate = 1367 KBytes/Sec. Simulated "Typical" rate = 206 KBytes/Sec. (basically a real-world test), and no apps running in the background. Test results were obtained using TimeDrive 1.3. TimeDrive 1.3 creates a temporary contiguous scratch file. measuring the time and converting to Kilobytes per Second. yield noticeably smaller seek times than the drive specification. Latency is the time for data to rotate under the heads. (On average, this is 1/2 the disk revolution time). locations within the selected volume. and last location within the selected volume. between your drive and the Mac once the drive gets there. and latency times are included in the calculation. Program by Roger D. Bates. (C)1990-1991. La Cie, Ltd.  All rights reserved. Click Of Death, Click Death, and COD are names describing the first symptom of a set of serious data threatening problems being encountered with increasing frequency among users of Iomega's Zip and Jaz removable media mass storage systems. 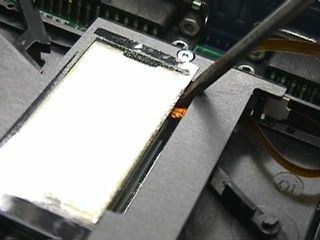 Without any warning a Click Of Death drive begins emitting a series of audible and distinctive clicking sounds, either when a cartridge is first inserted or when attempting to read or write data to or from a previously inserted cartridge. The word "Death" appears in the names for this problem since that's exactly what occurs in real life: Minutes, hours, or days after the clicking is first heard, the drive -- and usually one or more of the user's cartridges -- suddenly dies without warning. 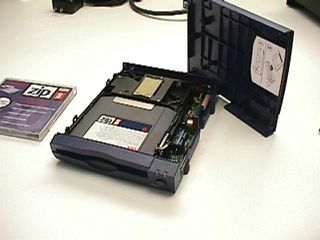 And since people tend to rely heavily upon their Zip and Jaz cartridges for the storage of their important data, this typically results in spontaneous, catastrophic, irreversible, loss of all their data. The uncertain nature of this problem, coupled with the catastrophic loss of so much user data, and the fact that a COD drive starts damaging its own cartridges -- which in turn appear to be "infected" with Click Death -- has generated a great deal of superstition and mythology, not to mention anger, on the part of Iomega's users. Iomega Corporation's reaction to this very real problem has been difficult to understand, since they've been largely unwilling to acknowledge and accept any responsibility for this very real defect in many of their products. As you can see when you browse the typical Click of Death web sites on the Internet, Iomega's policy of denial has fueled the fire and greatly upset their users more than anything ... even to the point of causing their users to file class action lawsuits. Iomega's customers are understandably unhappy because they feel that more warning should have somehow been provided to them, and that Iomega should be taking some reasonable responsibility for this sudden death problem. But so far it hasn't. Here's all you'll need to perform the disection. 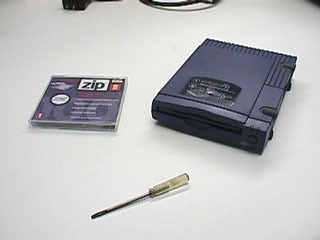 Your drive, the zip disk, and a small (thin blade) screw driver. Remember . . . . by opening this up you are probably voiding any warranty or hope of coverage should you mess something up. Personally, if you do this right, they'll never know you were in the thing. It's that easy to do. Here you see how the thing comes apart. If you look at the unit length-wise you'll see two slots where it's silver --- right in the "halves" of the unit. 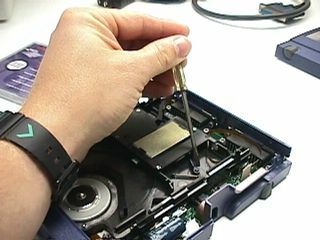 Simply stick the screwdriver in there (don't marr it or pry -- that's a good tip-off you've been in it!) and then gently squeeze the unit. That will pop the top loose from it's mounting tab. I would do the left side (opposite the feet) and then the right -- the right only has one tab to pop. At this point you'll have the top off. 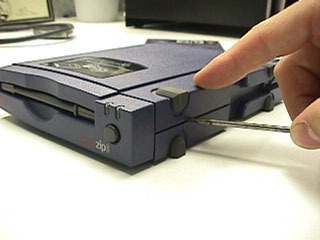 If the zip disk is still in it, there is a little lever in the rear that will allow the unit to pop the disk out without the power. Be careful with the unit from this point on -- the top holds the mounting rails into the unit. Make careful note how the drive mechanism and those mounting rails are situated. If I accidently let mine slip down, I can put everything back together with no problems, but make sure you can do the same! Now we get into the interesting "theory" part. You'll see the spring and the lever. That controls the return of the head back into the unit. My "theory" is that the unit gets jostled and will lock the head too far back. Once it does this, it won't move the head back to properly read or write again. On my particular unit, fixing this arm position always revives the unit. Your mileage may vary on what happens. My first thing to do, is to move the little arm by itself. (Shown here). This will ensure that the head will then move forward again. Next, I slide my screwdriver into the head mechanism slot. Very gently I move it forward. It WILL NOT move all the way forward the length of the rail. The servo (or whatever controls it) still has control over it . . . . moving it forward too far will cause irrepairable damage. That will also nix any hope of getting it fixed out of warranty later. Personally, at this point I put my unit back together, because it's usually fixed. I would recommend very carefully testing it. It's a pain, but it saves popping the unit apart again. I hook up the cables and slide a diskette in the unit. (At this point, you might accidently slide those rails apart -- so proceed with caution!) I power the unit up and check to make sure it reads from my zip disk. 90% of the time it does, sometimes I have to "re-jiggle" the head. Once you have verified everything you can button it back up and expect some more usage from your Zip drive. I personally believe the head mechanism is going beyond it's limit of travel and is catching. 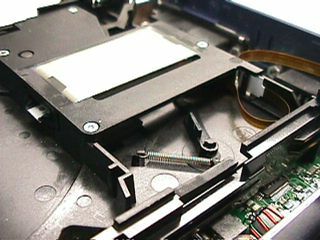 That might be causing the clicking noise when you attempt to read a zip disk. I'm thinking of adding a small spacer to keep the head just a teensy further bit forward. This problem will come back after some time -- that's why I'm looking at a permanent fix. This page was last modified on 10 April 2019, at 14:27.